Backless Vanity Stool Bench, Brass Metal Legs, Leather Seat and Storage Shelf. Available with White and Black seat in Leather. Very elegant and sleek designed to increase the level of elegance in the room that this stool is placed. Comes with a storage rack shelf. Created to offer everlasting beauty with its unique quality and look. - Manufactured in Spain. 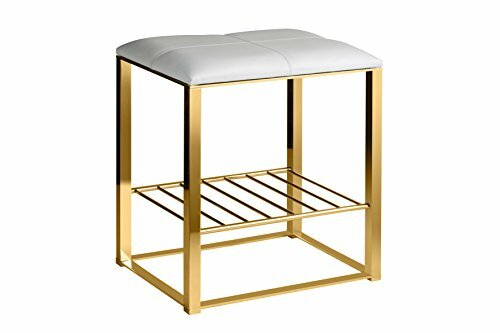 - Finish: Polished Chrome, Polished Gold - Material: Brass - Type: Floor Standing - Shape: Rectangular - Available in white and black Leather seat - Comes with a storage rack shelf - Dimension: 17.7 W x 13 D x 19.7 H in. Dimensions: 17.7 W x 13 D x 19.7 H in. If you have any questions about this product by W-Luxury, contact us by completing and submitting the form below. If you are looking for a specif part number, please include it with your message.